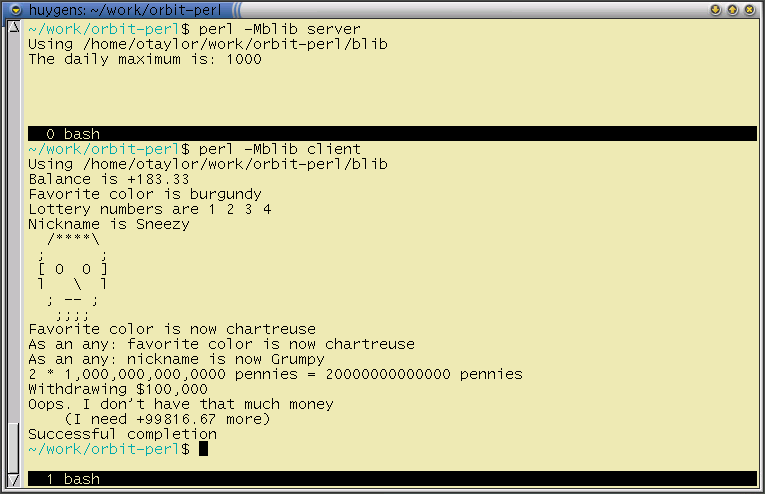 CORBA::ORBit is a Perl binding for ORBit. It is based on code from my earlier module CORBA::MICO, which was a binding for MICO. It is also very compact in terms of the amount of code necessary to implement clients and servers. CORBA::ORBit will work out of the box with the Gtk:: Perl module, and an example of this is included. Fix segfault when marshalling exceptions back to dead clients (found by Tobias Engel). Don't leak memory for arguments in argv array that ORBit removes (Paolo Molaro). Fix bug with the length of octet and char sequences (found by Guillaume Schmid). Work around problems compiling GNOME IDL files by removing __ORBIT_IDL__ #define. Fixed problem where most typecodes were not getting registered. Fixed bug that was causing ARGV to get mangled at initialization time. workarounds for reference counting problems in ORBit. Most things work in this release. You can write clients and servers using a large fraction of the ORBit types. Some things don't - WChar and WString types are not yet implemented; and the POA implementation is not complete. The interface-repository interface needs some work. First, the ORBit interface repository needs to be finished. Finally, it would be nice to be able to do same-address-space communication with a C ORBit interface. To do this requires some trickery and rewriting in ORBit so that you can marshal to a buffer then demarshal in the same process. Fixed minor problem parsing .gnorba files.